The region also boasts culture and history. The municipalities of Parnamirim and Nísia Floresta are known for their rich folk art tradition. Canguaretama is home to a 17th century sugarcane plantation, and Vila Flor's quaint village architecture dates from the 1900s. The most scenic route is the Rota do Sol (RN-063 state highway). 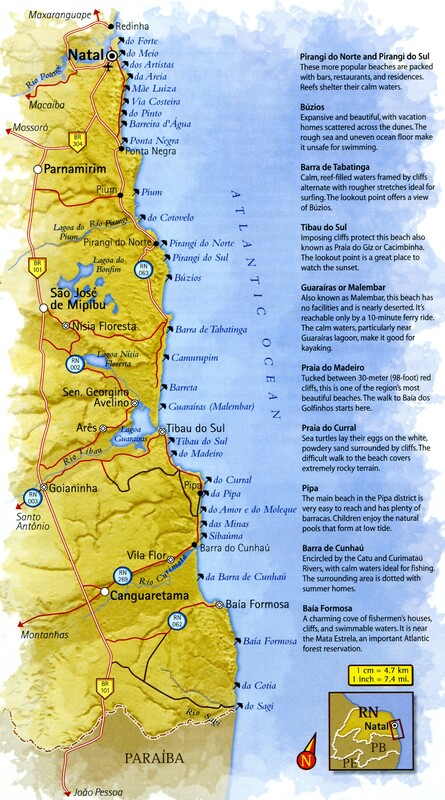 The road hugs the coast from Natal to Pipa, passing all sorts of beaches – from built-up Pirangi do Norte and Pirangi do SuI to the quieter Buzios, Barra de Tabatinga, Guaraíras, Tibau do Sul, Praia do Madeiro, and Praia do Curral - en route. To reach famous Praia da Pipa beach as quickly as possible, however, take the BR-101 highway. Schooner trips to the beaches of Pirangi do Norte, Pirangi do Sul, Búzios, and Cotovelo are popular excursions. The typical two-and-a-half hour outing makes a snorkeling stop in the Parrachos de Pirangi reefs, where you can see the small fish that live in the coral. Pirangi do Norte beach is home to the famous cajueiro de Pirangi, a giant cashew tree said to be 110 years old. (The species can live up to 400 years.) The top of the tree covers an area of 8,400 square meters (90,420 square feet), and the tree produces nearly 80,000 cashew fruits between November and January each year. The municipality of Nísia Floresta is famous for craftwork and for the large shrimp that inhabit its lake. Nísia Floresta is 43 kilometers (27 miles) south of Natal, accessible via either the RN-063 or BR-101 highways. The Associaҫão de Labirinteiras de Campo de Santana is comprised of 24 women who meet in the afternoon to produce labirinto (labyrinth), a famous style of Northeast lace. They work on wooden frames following traditional techniques. The women take orders for tablecloths, table runners, and entire dresses. The Associaҫão de Rendeiras de Alcaҫuz), is made up of 23 women who speciilize in renda de bilro (bobbin lace). This form incorporates varied, often surprising, themes and elements, including pineapples, church doors, and raindrops. You can taste and buy cachaҫa at Cachaҫa Artesanal de Alambique Papary, a welcoming orange house with the ambiance of an old sugar plantation. The cachaҫa is produced 7 kilometers away at Fazenda Brasileira Augusta, a farm whose stills can be visited if you make prior arrangements (RN-063). This district of Tibau do SuI is a place of beautiful beaches and varied nightlife. Cliffs and clear seas impart natural beauty, and a lively social atmosphere is apparent in the variety of restaurants, bars, cafes, stores and guesthouses spread around this old fishing village. Pipa, which surfers discovered about two decades ago, is 82 kilometers (51 miles) south from Natal. The town wakes up late - stores don't open before 11am – and retires late, too - the bars stay open until the early hours of the morning. Not everything is busy, though. Right beside Pipa Beach and other crowded stretches, strips of deserted shoreline such as Praia das Minas offer blessed solitude. In high season (December to February), Mestre Geraldo Cosme's dance group performs the coco-de-zambe, a folklore dance accompanied by drumbeat. The group gives performances in hotels in Pipa and Timbau do Sol. Central Praia da Pipa is the beach with the best facilities. It usually gets quite crowded in high season. Large, warm, natural pools appear among the reefs at low tide. Nearby Praia do Amor got its name (meaning Love Beach) because it seems to be heartshaped. On both Praia do Amor and the next beach to the south, Praia do Moleque, low tide creates shallow pools among the reefs and rocks. Fishes, octopi, and crustaceans often become visible. At high tide, there are good stretches for surfing. Visitors can reach these beaches from Praia da Pipa or by the steps embedded in the cliffs that frame them. Not many people frequent Praia das Minas, which is surrounded by high cliffs and untamed landscape. It has rougher seas and can only be reached by a rather precarious set of steps that are embedded in the cliffs. Set on 120 hectares (297 acres) of private, well-preserved Atlantic forest, the Santuário Ecológico de Pipa offers twelve short, well-signed trails of varying difficulty. The trail known as Caminho do Santuário passes by cashew and murici trees with labels identifying the species. You'll want insect repellent for the walks. The Caminho dos Piratas trail is one of the most difficult, with a descent by wooden steps to Praia do Madeira. Start early if you want a full day in the sun.You'll need to leave the beach before 4pm, as the Sanctuary gates close at 5pm. The Passeio da Peróba walk skirts the cliffs of Ponta do Madeiro and leads to Mirante das Tartarugas, a lookout point. To the right, looking out from the point, gray tucuxi dolphins (Sotalia .fluviatilis) sometimes cavort in the tranquil Baia dos Golfinhos bay. To the left, you'll spot Enseada do Madeira cove. Estrada Goianinha-Pipa, Praia da Pipa, km 23, Tibau do Sul. Dune-buggy trips from Pipa to Sagi, a beach on the Paraiba border, offer wonderful views of the sea, Praia do Amor, Praia do Moleque and Praia das Minas. The buggies leave from Chapadão, on top of the cliffs. From Ponta do Cabo Verde, a piece of land that looks like a barrel (or a pipe, hence "pipa"), the route passes several beaches. The first is Praia de Sibauma, a large beach fronted by calm seas. Next is a ferry crossing over the Catu River to the lovely Praia de Barra de Cunhaú. Another ferry over the Curimataú River takes you to Praia dos Coqueiros, a large expanse of white sand full of coconut trees, with calm seas. Approaching Baia Formosa, you again see stretches of white sand, this time surrounded by cliffs and rocks. This bay has calm waters protected by reefs, as well as rougher waters that are good for surfing. There's also a small port and lookout point with a view of the bay, its boats, and Praia dos Coqueiros. Baia Formosa is the gateway to Mata Estrela, the largest remaining stand of Atlantic forest in Rio Grande do Norte. Its 2,039 hectares (5,040 acres) include resting vegetation, brazil wood trees, dunes and lakes, such as Lagoa Coca-Cola, which is named after its dark waters. Nearby is the Rio Sagi, a narrow river with dark waters, where you can swim amongst the mangroves. With luck you might see Xuxu, the manatee that has appeared here so often that it has been given a name. Baia da Traiҫão, in Paraiba, is on the other side of the river.